The TE 99 was formerly known as the Eyre/BICERI Universal Wear Machine and has a worldwide user base. The original machine design was made by Dr. Terry Eyre of Brunel University and Neale Consulting Engineers and it was subsequently marketed and manufactured by BICERI Limited. Plint and Partners now own the rights to the machine and have made a number of mechanical improvements and upgraded the control to their standard COMPEND 2000 Windows based software and SLIM 2000 Serial Link Interface Module. 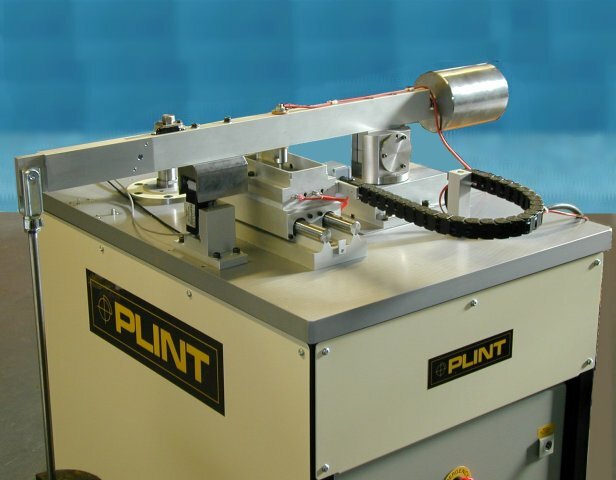 The Universal Wear Machine is suited to the wear testing of materials in pin on disc or pin on plate modes. The TE 99 has a Class 1 contact configuration (pin or ball loaded vertically downwards onto a horizontally rotating disc) and may perform tests according to the guidelines laid out in ASTM G 99, DIN 50 324 and ISO/DIS 7148-2. In reciprocating mode the machine can perform tests according to ASTM F 732. The control unit includes the SLIM 2000 Serial Link Interface Module and COMPEND 2000 Windows based control and data acquisition software. The automatic control of speed, temperature and test duration, combined with flexible data logging and alarm level checking, greatly facilitates use of the TE 99 for in-depth parametric studies in the wear of materials as well as more routine screening and development problems. The operating ranges can be extended with options for a heated lubricant enclosure, a reciprocating plate adapter and fixtures for piston-ring/cylinder liner specimens in reciprocating mode. The machine base frame holds the disc carrier spindle and the load/friction measurement system assembly in a fixed, accurately aligned, orientation. The test pin is fixed in a sliding carriage clamped to the load beam. Nominally flat on flat contact is possible with a level load beam, but in practice this is difficult to achieve. Balls and pins with a radius, conical or triangular tip are recommended as these self-align when they wear. The load beam is counter-balanced and pivots at one end on suspended roller bearings. At the other end of the beam, large weights are supported on a weight carrier that overhangs the base plate and small weights rest on the beam located by a steel peg. The wide load range achievable allows parametric studies to be made based on load. It should be noted that there can be considerable inertial effects at higher loads caused by weight bounce and this can influence the wear rates and/or mechanisms. This problem can be more acute with high hardness test materials. The load beam pivot is trunnion mounted. When the beam is horizontal, it is restrained from transverse movement by a strain gauge force transducer. A retaining clamp maintains the beam in contact with the transducer at all times, ensuring that bi-directional forces generated in pin on disc and reciprocating contacts are measured. The transducer output connects to a strain gauge amplifier and the output from this is passed through a true rms/dc converter and then connected to the interface to give averaged friction readings in both uni-directional and reciprocating pin on plate modes. The test disc is mounted on the disc carrier spindle and secured by a central bolt. The spindle is driven through a pulley belt by the vector controlled a.c. motor mounted beneath the machine. The motor has encoder feedback to ensure stable running speeds. The track radius is set by moving the pin carriage along the beam and locking in place. This permits multiple tests to be performed on one disc specimen with a spacing of 2 mm between tracks. An integral scale on the beam is used to determine the radius set. An indication of wear processes going on in the contact is given by a linear potentiometer mounted on the pin carriage. 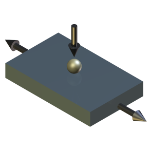 This transducer measures the vertical movement of the pin relative to a fixed datum during a test (this can be due to wear, thermal expansion and wear debris generation). The pin carriage is electrically isolated from the load beam and therefore from the disc specimen. This allows a small potential to be applied across the contact from a Lunn-Furey Contact Resistance Circuit. The connection to the disc spindle is via a slip-ring. Variations in the voltage across the contact are indicative of the amount of contact between the pin and disc specimens provided that both are conductors of electricity. Maximum voltage (typically 40 mV) corresponds to no contact (open circuit) while zero voltage corresponds to full contact (closed circuit). The voltage signal will typically fluctuate rapidly during a test so an rms signal is used for recording purposes. This kind of measurement is extremely useful when working with lubricants containing additives, solid lubricants and surface coatings. The contact measurement can be used to assess the formation and breakdown of high resistance chemically bonded films on the metal surfaces and the failure of coatings/films in the contact. The most important parameters to calibrate on the TE 99 are the friction force and wear. 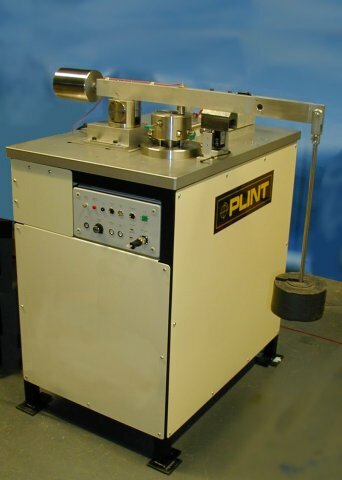 Included with the machine are a pulley, cord and weights to apply a tangential force to the load beam for friction calibration and a slip gauge for wear calibration. The TE 99 has PC based sequence programmable control and data acquisition. This is provided by an integrated Serial Link Interface Module and COMPEND 2000 software running on a host PC, operating under Windows. Data is stored to hard disc in standard spread sheet compatible file formats (.csv or .tsv). The Reciprocating Pin on Plate Adapter mounts on the machine base plate to the right of the drive spindle. 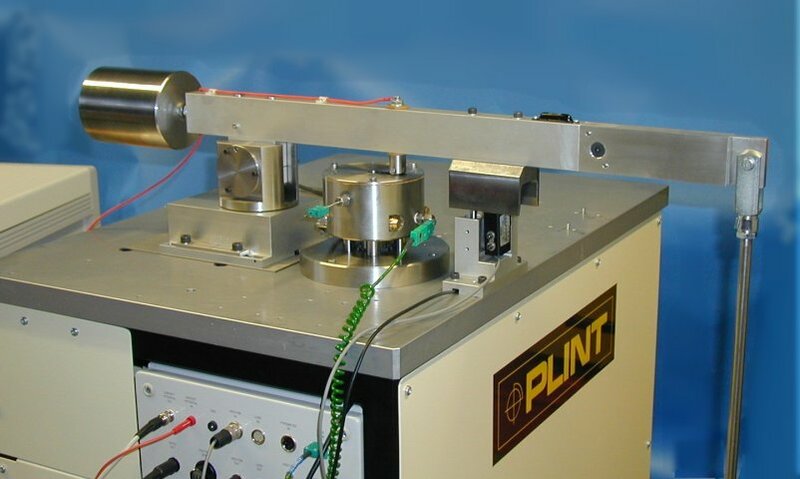 The trunnion mounted load beam/friction sensing system is also moved to the right so that the test pin is located at the centre of the plate stroke. The fixed plate specimen is located on two screw fittings in a stainless steel reservoir. The reservoir is clamped to a block that is heated by electrical resistance elements and the temperature is monitored by a thermocouple pressed against the side of the specimen or holder. The reservoir can be moved sideways on the heater block so that multiple tests can be performed on one plate specimen. The heater block is mounted on a small base plate, restrained to move in a horizontal plane by linear bearings. This plate is reciprocated by means of a simple crank connected to the drive spindle. 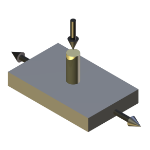 The crank pin position may be adjusted to provide a range of strokes. The reciprocating adapter offers a valuable extension to the operating range of the TE 99. In particular the reciprocating contact offers a more realistic simulation of some practical contact situations (for instance reciprocating seals, piston ring and cylinder liner and other repeating contacts). The maximum operational frequency at 110 mm stroke is limited to 1 Hz for reasons of machine vibration. Higher frequencies are permissible provided that the total stroke is reduced (e.g. 5 Hz at 50 mm stroke). 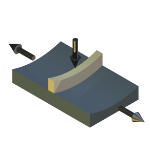 The primary role of the pin on disc machine is as a tool for the analysis of the wear of materials. The reciprocating pin on plate adapter is likewise a tool for the analysis of wear. One of the chief differences is in the dynamics of wear particles. 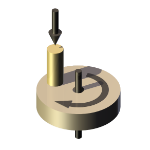 In the pin on disc, the particles are free to move away from the contact area, whereas in the reciprocating contact there is a much higher chance of the particles being involved in the contact and to contribute to the friction characteristics. The reciprocating adapter is also more suitable to the study of abrasion than the pin on disc mode, again because of the way in which the abrasive particles will be involved in the contact region. 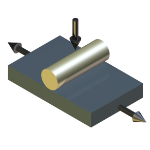 The linear motion makes this mode suitable for studying different surface finishing techniques. The TE 99/LE is a stainless steel enclosure that mounts over the drive spindle. It is sealed against the rotating shaft and provided with a lid to permit tests to be run with the disc fully immersed in fluid. Electrical resistance heater elements are mounted in the base of the enclosure to allow the fluid temperature to be controlled up to 200°C. Thermocouples are provided to monitor the enclosure and fluid temperatures. The fluid may be fed by gravity or circulated through the enclosure using the TE 99/LS or other suitable circulation system. The feed position is on the lid close to the in-running side of the contact and the drain is located at the base of the enclosure. The Lubricant Recirculating System uses an anodised aluminium bath and lid with inlet, outlet and thermocouple ports. The bath is mounted on a laboratory heater/stirrer unit. A magnetic paddle is placed inside the bath to ensure that the liquid is heated evenly. The temperature of the liquid is monitored by the thermocouple mounted in the lid and the value is read off from a free-standing temperature display unit. The temperature set-point is selected manually on the heater unit. There are two integrated peristaltic pumps, one to pump liquid from the bath to a test adapter and one to scavenge the fluid from the test adapter and return it back to the bath. The scavenge pump does not have to be used if the fluid is of low viscosity (eg water) when a gravity return is sufficient. The TE 99/HT comprises a stainless steel enclosure, a method of heating and a temperature sensor. The enclosure surrounds the disc specimen and has an inlet and outlet port and a lid with access for the pin specimen and a viewing port. The air heating system consists of a high power air blower with electrical resistance heating element. The hot jet is directed into the inlet port of the enclosure and the exhaust is directed to a chimney covering the outlet port. The temperature of the disc specimen is measured using an optical pyrometer. The pyrometer is a non-contacting device with a focal distance of 76 mm (distance between the lens and the disc edge) with a k-type thermocouple output. The pyrometer is used to monitor and control the temperature in the enclosure. Sample holders for running tests with piston ring and cylinder liner on the TE 99/R Reciprocating Adapter. This incorporates a self-alignment mechanism to ensure face contact is maintained. Metals and Materials, 3(3), 1969, 86-91. Engineering Materials and Design, 15, 1972, 327-333. Institution of Mechanical Engineers, l9th Conference of Tribology Group, Paper C101/72 (1972). Metals and Materials, 6, 1972, 435-439. ASLE/ASME Conference 1974, ASLE Paper 74-LC1B-1. Proc. I. Mech. E. International Conference on Scuffing, 1975, Paper C74/75. Powder Metallurgy, 1(1), 1976, 22-30. Tribology International, 9(5), 1976, 203-212. Tribology International, 10(5), 1977, 281-285. The British Foundryman, 70(12), 1977, 349-356. Tribology International, April 1978, 91-96.???? Tribology International, 11(4), 1978, 241-242. Tribology International, 11(5), 1978, 267-271. Heat Treatment of Metals, 4(5), 1978, 103-105. Treatise on Materials Science and Technology, Volume 13 “Wear”, Scott D. ed., Academic Press Inc., 1979. The Institution of Metallurgists, Surface Treatments for Protection, Spring Review Course, Series 3, No. 10, April 1978. Microstructural Science Vol. 8, Proceedings of the 12th Annual Technical Meeting of the International Metallographic Society, Stevens, Vandervoort and McGall eds., 1980. ASLE Lubrication Engineering, 4(4), 1981, 216-221. Powder Metallurgy, 24(2), 1981, 57-63. ASLE Lubrication Engineering, 7(1), 1981, 603-607. ASLE Lubrication Engineering, 40(4), 1984, 218-224. Metals Society World, 3(1), 1984, 11-12. In Tribology Offshore, ISBN 85298 5231, MEP, 1984, 15-24. Tribology in Mineral Extraction, War on Wear, ISBN 085298 5436, Paper C343/84, 1984, 29-34. Proc. I. Mech. E. Conference, “Combustion Engines, Reduction of Friction and Wear”, ISBN 085298 5592, C74/85, 1985, 139-153. First International Conference on Surface Engineering, The Welding Institute, 1985, p16, 203-222. Tribology International, 18(5), 1986, 259-266. Aluminium Technology, Institute of Metals, Paper 100, 1986, 485-492. Metals and Materials, 2(7), 1986, 426-430. Metals and Materials, 2(10), 1986, 625-630. Tribology International, 19(2), 1986, 87-91. Tribology International, 20(1), 1987, 18-24. Proc. 2nd International Conference on Surface Engineering, The Welding Institute, 1987, 43-1 to 43-14. Proc. 2nd International Conference on Surface Engineering, The Welding Institute, 1987, 2-1 to 2-16. Surface Engineering, 4(3), 1988, 227-232. Eurotrib ’89 Congress, Helsinki, June 1989, Vol. 5, 142-149. Surface Stability, Institute of Metals, 1989, 186-240. Proc. I. Mech. E. Conference “Combustion Engines, Reduction of Friction and Wear”, C375/029, ISBN 085298 6955, 1989, 125-132. And reproduced Tribology International, 23(1), 1990, 11-16. Proceeding Nordtrib ’90, Hirtsals, Denmark, ISBN 87-983538-0-2, 1990, 31-46. 11th RISO International Symposium, Roskilde, Denmark, 13-26. Tribology International, 23(3), 1990, 163-171. Metals and Materials, 7(3), 1991, 143-148. Tribology International, 27(3), 1994, 171-181. MPIF Conference, “Advances in Powder Metallurgy & Particulate Materials, San Francisco, Vol. 6, 1992, 265-279. MPIF Conference, “P/M Reaching New Heights”, Chicago, Vol. 5, 1991, 135. Presented at 4th International Symposium on Advanced Materials ISAM-95, Islamabad, Pakistan, 1995. Proceedings of the 2nd International Conference on Heat-Resistant Materials, Natesan K, Ganesan P. and Lai G. Eds., Gatlinburg, Tennessee, 11-14 September 1995, 457-461. Tribology International, 32(6), 1999, 305-314. Paper # 239 Comparison of Sliding and Abrasive Wear Mechanisms for Cemented Carbides and Ceramics. Proceedings of 2nd International Conference on the Science of Hard Materials, Institute of Physics Conference Series No 75: p919, Adam Hilger, 1986. Paper # 240 Results from a UK Interlaboratory Project on Dry Sliding Wear. Paper # 241 Some Observations of Ceramic-Metal Sliding Wear. Paper # 243 Ceramic Wear Testing and Design. Materials Engineering and Design, Eds B F Dyson and D R Hayhurst, Proceedings of the I of M meeting on Materials and Design, May 1988, 1989, Institute of Metals, p.159. Paper # 244 Effects from vibrations in wear testing of ceramics. Paper # 245 Effects of Test Variables in Wear Testing of Ceramics. Paper # 246 Effect of Surface Finish on the Sliding Wear of Alumina. Paper # 249 The Effects of Surrounding Atmosphere on the Wear of Sintered Alumina. To be published in Wear. Paper # 250 Results from a UK interlaboratory exercise on the wear of alumina. ASTM STP 1167, Wear Testing of Advanced Materials, pp. 129-150. Paper # 251 Effect of Test Machine Dynamics on the Sliding Wear of Alumina, Wear Testing of Advanced Materials. Paper # 252 Modification to the Surface Layers of Alumina in Sliding Wear. Paper # 253 The Formation of Glass in the Wear of Reaction Bonded Silicon Nitride. J Appl Phys D, 1A(1992)A182-A188. Paper # 254 The Application of Confocal Scanning Microscopy to the Examination of Ceramic Wear Surfaces. J Appl Phys D, 1A(1992)A230-235. Paper # 255 The Formation of Aluminium Hydroxide in the Sliding Wear of Alumina. Paper # 256 Sliding Wear of Alumina. Paper # 258 Wear Metrology: The Art of Determining a Material’s Performance. Paper # 260 Wear Testing and Ceramics. Proc Instn Mech Engrs, 208(1994)153-166. Paper # 267 Measurement of Friction Under Simulated Metal Working Conditions in Miniaturised Test Systems. Paper # 303 Combined effect of speed and humidity on the wear of silicon nitride. NPL Report DMM (A)36, September 1991. Paper # 304 Guidelines for Unlubricated Sliding Wear Tests: Part 1, General Approach. NPL Report DMM(A)96, April 1993. Paper # 305 Guidelines for Unlubricated Sliding Wear Tests: Part 2, Procedures for Pin-on-Disc Testing. NPL Report DMM(A)97, April 1993.